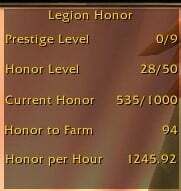 Simple addon that adds a frame that shows your current honor statistics. You can also set a goal of how much honor you wish to farm. Tracks Honor Gained per hour. Slash Command: /legionhonor or /lghr to see available commands.